Not my first time visiting the Discovery, but the first time to be onboard as a Wedding Bagpiper! This was for Andy and Yvette’s wedding. I always like playing at outdoor weddings, and especially at a unique venue like this one. The Discovery, of course, is the famous ship which took Robert Falcon Scott and Ernest on two Antarctic exploration missions. The first one was very successful, but the second unfortunately, not so. The ship is berthed in a dry dock at Discovery Point in Dundee, next to the new V&A Museum. 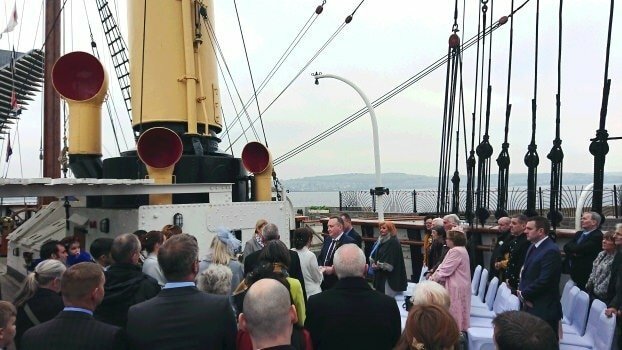 Andy and Yvette’s Wedding Ceremony took place on Discovery‘s main deck, just “aft” of the main mast and comfortably sat around 50 people. 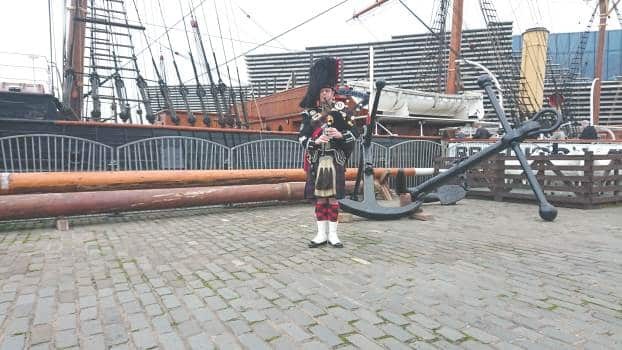 I piped Yvette onboard, played again when Andy and Yvette signed the Register in the historic Chart Room, and played them off the ship and into the Discovery Museum on Discovery Point just beside the ship. The ship and the Discovery Point museum appear to offer very reasonable prices for Wedding Venue hire!